This past Saturday, I spent the day in Evansville, IN. I was there for their annual Night of Memories. 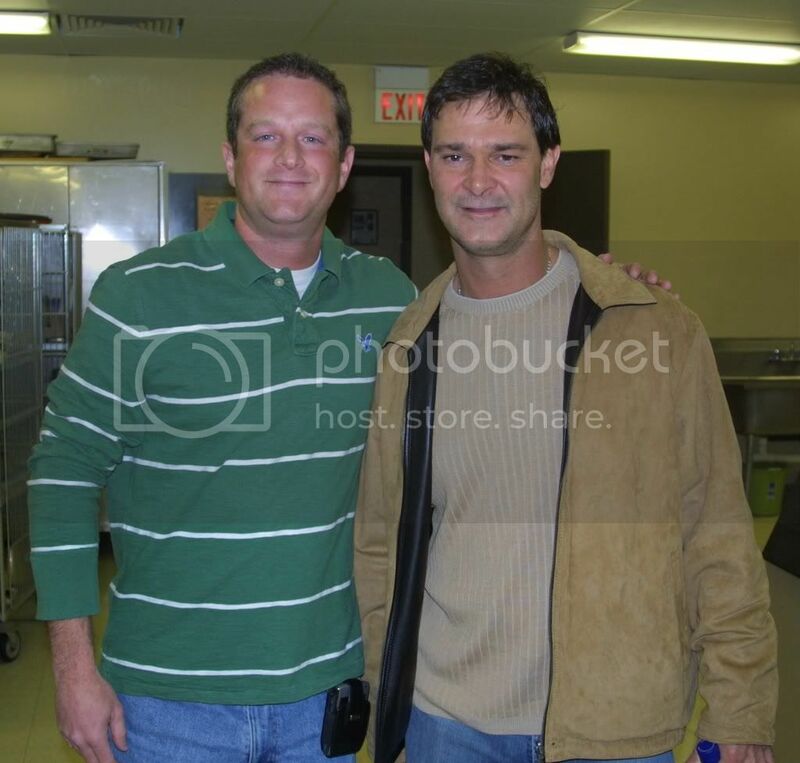 Actually, I was there to meet my hero, Don Mattingly. Donnie Baseball has been my favorite player ever since the first time I saw him play in 1984. He has continued to be my favorite player up to this day. But, despite growing up in New York, I have never met, or come close to meeting, Don. After speaking with the promoter multiple times and convincing my wife, I was on my way to Evansville. With all of the hoopla surrounding Don and his wife this past week, I was unsure if this day would even happen. It did happen and it was just about everything I could have asked for. I got to spend about 10 minutes chatting with Donnie as he signed everything I brought to Evansville. That included 5 - 8x10’s (including one from his rookie year), 1-16x20 from the last game of 1984 (when he went 4-5 to beat Dave Winfield for the batting title), 2-11x14’s, a game-issued 2006 jersey, a game-used batting glove from the late-1980’s, and a baseball. He signed them all as I had asked, ranging from “Donnie Baseball”, to “1985 AL MVP”, to “To Mike”. Afterwards, we got a picture together. While all of this was happening, the Evansville paper was taking pictures and notes for a story to run in the local paper. Donnie excused himself to go and sign about 500 more autographs over the next 90 minutes. After the autograph signing, there was a reception in a different building. The promoter was gracious enough to sit me at the main table. I looked with awe at the nameplates, Don Mattingly, Preston Mattingly, and Brooks Robinson. During the reception, there was a Q&A session with the local athletes, followed, by a live and silent auction. I got a few more opportunities to talk with Donnie. After 1-2 sentences, he was always interrupted or pulled away. I did get to tell him about us Mattingly collectors and asked him about his LVS 1728 bat. The numbers are for his 2-oldest son’s birthdays (he hadn’t had his 3rd child by that time). He said that he didn’t design them well…the barrel was too small and they were always breaking. He seemed surprised that there were even some “out there” (you got a keeper George!!!). The thing I’ll remember most is that, at the end of the night, he pointed at me from across the room. He walked from one side of the room towards me, asking people to “hold on” as he made his way to me. He said, “Hey man, Preston and I are taking off. But, I wanted to say thanks for coming”. Pretty awesome guy…glad he was and still is my hero. Don looks like he could still jack an opposite field double anytime he wants. He was always one fo my favorites growing up too. I've got a huge piece of artwork here that someday I'll pay the $80 for him to sign. Congrats on a super day! Awesome!! You can't put a price on an experience like that. Congrats! Sounds like a real down to earth kinda guy. Wow, very cool story and congrats on hanging out with your hero. Looking for: Joey Votto game used items. Thanks for sharing your awesome story! What a breath of fresh air. Outstanding story! Thanks for sharing. Mattingly reminds me a little of Dale Murphy, my childhood hero. I've met Murph a few times over the years and he's always first class, sort of like everything I've ever heard about Mattingly. "The knowledge that this guy has in his head, some of you would never be able to comprehend." I picked up the game used batting gloves last week. I was afraid he wasn't going to sign them based on one of my phone conversations with a worker from the event. But, he didn't even bat an eye. I had to pay $20 extra for Donnie to sign the jersey ($50 vs. $30), but it was worth it. I'm trying to convince my wife for me to go again next year. Let me know if you're up for it. It would be cool for you to bring your LVS 1728...it would strike up a good conversation. Thanks for sharing. Its great to hear when a fan gets to meet his favorite player and it works out like that!